We have discussed what is basic functionality difference in Fuel Injection system vs Carburetor and the basic requirements of the fuel Injection system in the previous article. Now we are going to discuss the classification of the Injection system. In usual Compression Ignition engines, the air is compressed in the cylinder during the compression stroke, at the end of the compression stroke the fuel will be injected into the cylinder with the help of fuel injection system. To atomize the fuel or attain the required amount of the pressure inside the cylinder, we can use the mechanical means or air itself. 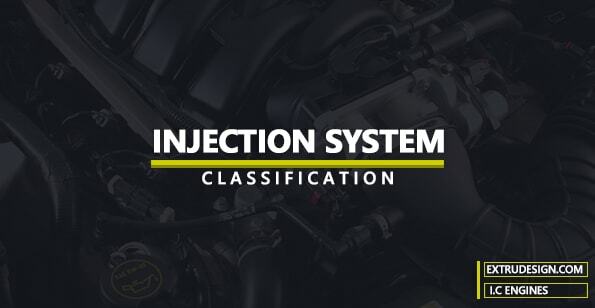 The following classification of Injection system is based on this function. Now, let’s discuss more details about these Injection systems. In this Injection system, the fuel will be injected into the cylinder by means of compressed air. So it needs an additional compression system for the Injection System. Due to this additional system, the weight of the engine will increase which will result in the reduced brake power output. This type of fuel injection system is used very less nowadays because of the bulky design of the engine. Since it needs an additional mechanical compressor system. High viscosity fuel can be used which are comparatively less expensive than the fuel used by the Solid Injection System. Can achieve higher Mean Effective Pressures (MEP) due to the good mixing of fuel with the air. In this Injection system, the fuel will be directly injected into the cylinder without the aid of the compressed air as like in the Air Injection System. This can be also called as the Airless Mechanical Injection System. In this Solid Injection System, There are different types of Injection Systems are there. In this Injection system, each cylinder will be provided with the individual pump and the nozzle system. The high-Pressure compression pumps will be provided for each cylinder, but the arrangement will be close to each cylinder as shown in fig(a) or they may be clustered together as shown in fig(b). The HP pump will be operated with the help of CAM mechanism. 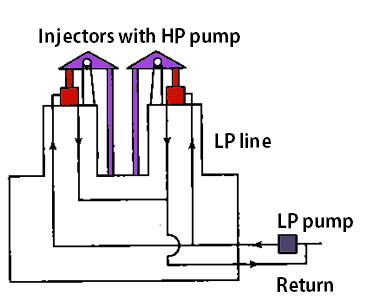 The HP pump will produce the necessary pressure to open the injector valve to inject the fuel into the cylinder. The amount of fuel injected into the cylinder depends on the effective stroke of the plunger. The fuel injector nozzle and the pump will be enclosed in one housing as a unit and this unit will be provided for each cylinder. There will be a low-Pressure pump operated by the rocker arm actuated the plunger. The amount of fuel injected into the cylinder depends on the effective stroke of the plunger. This injector nozzle and the LP pump are enclosed as the one single unit as shown in the above fig. As we can see the schematic representation of the Common rail system above. It consists of the common header for all the fuel injector nozzles. The fuel will be supplied to the header by a High-Pressure pump. 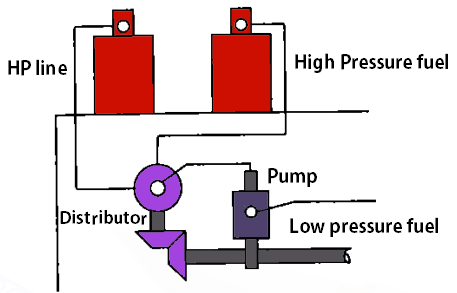 The high pressure in the header will pass the fuel to each nozzle at each cylinder. At the correct time, a rocker and rod mechanism will let the valve open for the fuel to enter into the cylinder through the nozzles. In this Distributed system, there will be a pump which will take care of all the three operation Pressurizing and metering and timing on injection. The fuel will be sent to the rotating distributor to inject the fuel into each cylinder. The uniform distribution of the fuel can be achieved due to the one metering device. There is one more advantage is that the cost of the injection system is also less. AS we can see the different types of injection system such as the Air Injection system and the Solid Injection System. And further classification in the Solid Injection system. If you have any further thoughts on this topic, let us know in the comment section below.